The Democratic presidential candidates are coming out of the closet to announce they are in. The senators get instant national recognition because taxpayers provide them with a public relations department in the center of the political media. 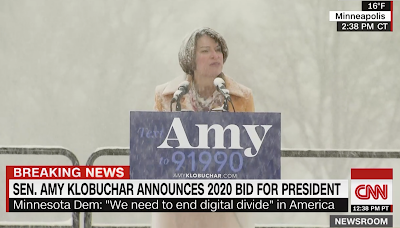 Democrat Amy Klobuchar of Minnesota gave her formal announcement on Sunday. Outdoors. In the snow. Ann Althouse wrote, "She's getting snow covered and quoting Walt Whitman as she announces her candidacy." President Trump tweeted that Klobuchar looked like a snowman. She tweeted back something about global warming. It's science, she sniffed. Well, be that as it may be, it was snowing and she should have had enough sense to come out of the snow. CNN's take was she said, "We need to end digital divide." Yep, she heard America singing, "We need to end digital divide." She has the pulse of the people, I don't. All I thought was someone on her staff convinced her that standing outside in the snow without a hat on while quoting a 19th century poet is Lincolnesque. I wonder why they would do that to her. Politico reported, "Sen. Amy Klobuchar is pitching herself for the White House as the commonsense Midwestern answer to President Donald Trump — while former staffers portray her as a brutal boss who mistreated them." She wants to be the next Hillary. Well, standing in a snowstorm without a hat will make one as cold as her. Democrats Kamala Harris of California and Cory Booker of New Jersey want to be the next Obama, which is better because at least he will go down in history as a president. Harris launched her political career 20 years ago by having an affair with longtime California political kingpen Willie Brown, who was twice her age at the time. He got her appointed to a six-figure, do-little job in state government. Brown wrote in a column this weekend, "Make no mistake, President Trump’s State of the Union address was the kickoff for his 2020 re-election campaign, and so far I've yet to see a Democrat who can beat him." Turning Democrat women protesters into cheerleaders shouting, "USA! USA! USA!" was a good start for the president. How is Booker doing? 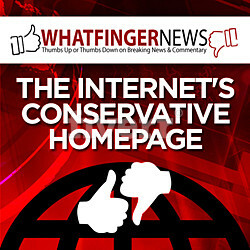 His big news last week was, "Cory Booker confirms he has a girlfriend." I was going to suggest he grow some facial hair like Ted Cruz did but I see where Booker already has a beard. Bernie Sanders of Vermont is still stumbling about. He confused protest votes for a mandate. Democrat Elizabeth Warren of Massachusetts is trying to out-Donald The Donald. She told a crowd, "By the time we get to 2020, Donald Trump may not even be president. In fact, he may not even be a free person." He may be a free man. He may not be a free man. But one thing is for sure about 2020: Warren still won't be an Indian woman. Like Klobuchar, Warren wants to be the next Hillary. She is just like her with less baggage and without the hacking cough but with the same congenital lying. At least she has sense enough to come in out of the snow. > The Democratic presidential candidates are coming out of the closet to announce they are in. What's the difference between 2016 and 2020? Candidate wannabes are no longer afraid of the Clinton machine. This is how things should have been in 2016, at the end of the two-term Obama era. It's a tribute, in a backhanded sorta way, to the Clintons that they had acquired such an iron grip on the party. Don't worry, though. They'll make more. > I wonder why they would do that to her. Might have something to do with the Senator being so awful to work for, Harry Reid had to have a talk with her about it. The Senate has proven to have been a poor source for Presidents. And now the Klob want us pick back bencher. It occurs to me that cow farts are the answer to renewable energy and ultimately, saving the planet which AOC tells us is due to end in 12 years. 1. Cow farts can be harnessed to propel combustion engines. As every teen aged boy knows, farts when ignited produce a mini explosion similar to gas exposed to a spark in combustion engines. 2. Cow farts are not dependent sun or wind (they produce their own). 3. Cows are vegetarians thus can be fed on grass clippings that are otherwise dumped in landfills from suburban yards, college campuses, business campuses, highway medians and city parks. 4. Cows are renewable - pair a genuine female with a genuine male (not the transsexual kind) and presto! New cows. 5. Cows produce continuous supplies of edible dairy products during their lifetimes and are delicious when dead. I think the left is really missing the boat on this one. Cows are the ultimate green energy. No wonder they're revered in India. Now that's a Green New Deal we can support! Poopsie! You've made my day! "Cow farts are not dependent sun or wind" Cow farts are not dependent on the sun but, are difficult to collect in the wind. �� good one Jim! Poopsie makes great points tho! I gave up on global warming years ago. Now I just want it to get above zero F. here in Montana's banana belt. It must be tough living in the tropical part of Montana. If God didn't want us to eat meat, why did he make it taste like food? I don't think the Bernie voters were just protest voters, though. They want socialism bad. A former Minnesota resident called in Monday to Howie Carr's show with some interesting backstory about Amy from Minnesota. It turns out her father wrote a folksy, well-loved column for the Minneapolis Star-Tribune for decades. "If her last name was Johanssen or Nelson," the caller said, "she'd be shuffling paper in the Ramsey County DA's office." Where did she get her ferocious temper? Why, from dear old Dad. At one point in his career, the elder Klobuchar had a radio show, which revealed him to be a screaming, crazy lefty who routinely berated his guests and callers on the air. The fruit doesn't fall far from the tree. "How is Booker doing? His big news last week was, "Cory Booker confirms he has a girlfriend." I was going to suggest he grow some facial hair like Ted Cruz did but I see where Booker already has a beard."